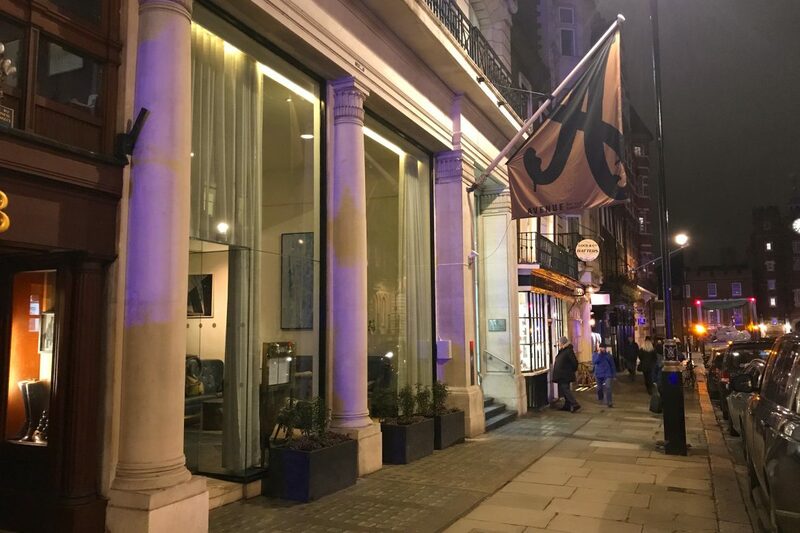 Avenue on St James’s Street has been one of those places I’ve been dining at since it first opened. I was a kid and going regularly for lunch with the family after visiting the RA just up the road on Piccadilly; the Sunday roast beef and Yorkshire pudding was just superb. As often happens with old regular haunts like these, years went by when I didn’t go, but I now find myself going back to this D&D restaurant once again with increasing frequency, either for the bottomless brunch or a light dinner. Most recently I was there with a group of friends, including London Lamppost contributors Brian Hick and Marshall Allender, after seeing Blade Runner 2049 (a superb film, the plot twist maybe a little obvious, but the filming, performances and the styling – they carry on the styling from the original film – are superb). 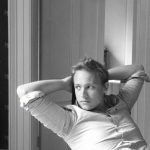 In need of somewhere reasonably priced and that would have room despite us not having reservation, Avenue was the perfect solution when Brian’s original plan of Zedel fell through thanks to a 2 hour wait. As ever the friendly staff at reception had no problem squeezing us in, and onto one of the large round marble topped tables in the cavernous dining space that opens up as you get to the end of the long bar at the front of the restaurant. The menu is modern with international hints – mostly American and European. But watch out with it, as it’s an odd mix price wise, some dishes seem good value while others in comparison seem overpriced. 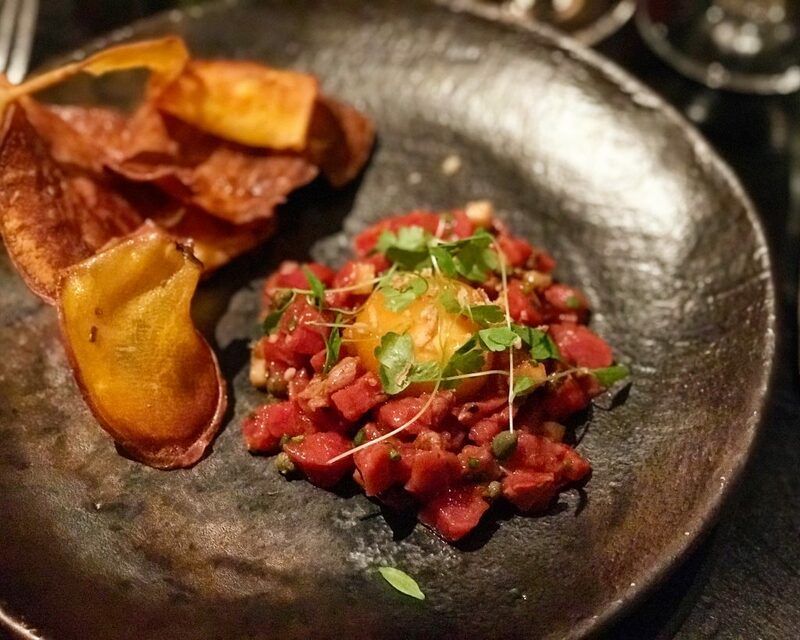 The steak tartare was the great surprise, so much so that I rewrote the Lamppost’s run down of the best alternative style steak tartares in our city. As one hopes for with steak tartare it had good heat, but what made it really stand out was the chunky size of the fillet, larger than usual it gave it a real bite and texture. The inclusion of apple along with the traditional yolk and capers gave a freshness that paired well with the earthy sweet potato crisps. The only note against it was that for something that advertised being smoked, there wasn’t much smokeiness too it. All in all though a great dish worth ordering time and again. The well priced ribs for main course with a side of fries were an apt metaphor for the general feeling we had as a group, both about that dinner and pervious visits to Avenue, – perfectly decent, but a little lacking compared to others on offer elsewhere and even available at Avenue a few years back. 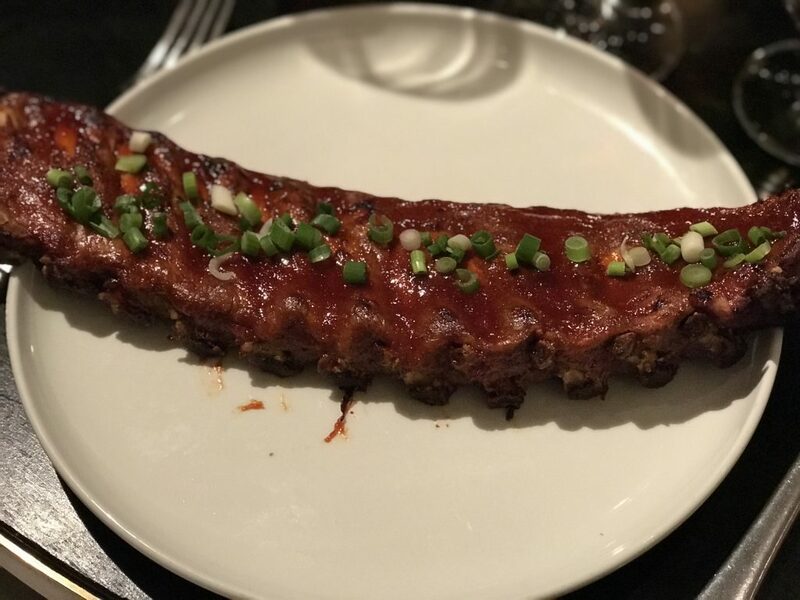 The ribs were perfectly nice, the sauce had a nice barbeque rub spice to it and the spring onion was a welcome addition both as a flavour and in the way it cut the spice of the sauce. The problem was that there was no where near enough of the sauce and what was there was a little dry from the oven or the heat lamps of the pass, while the fries were truly dreadful; cold, lacking any seasoning and just bone dry. All of the faults in the food were evident in the service too. The waiters were efficient but, with the exception of the friendly Maître d’, impersonal. They have also gone down the oddly popular uniform style of having the staff dress in light country tweed trousers and matching waistcoats. I have no problem per se with this style, my issue is that in almost every instance you see it, including at Avenue, at least one item is ill fitting (often the waistcoat) and worn wrong (again often the waistcoat) with the white shirt hanging out at the back as the trousers are too tight fitting and low sitting; many of the uniforms at Avenue could have done with a wash too – I appreciate it can be a messy job but that’s no excuse for not washing them regularly to remove the splashes of dried sauce. So why do I still go, and why should you go? Well simply put, despite its negatives, the quality of the ingredients are high, the staff always look after you and ensure you have all that you need, it’s a great space to dine in, and best of all you can have a reasonably priced meal for the quality (if carefully chosen). I wouldn’t go just as a twosome, unless circumstances dictated. No. Its real strength is being a great place to go with a group of friends, where the food and everything else is the backdrop to a great time and a laugh. For this Avenue is ideal, and the bottomless brunch is perfect.